The water treatment industry has evolved over the last 30 years, from being concerned primarily with bacteria that cause operational inefficiencies i.e fouling, corrosion and heat transfer reduction, to treating bacteria of a more pathogenic nature… namely Legionella. Cooling Towers or Water Cooled Systems, whilst vastly more efficient than air cooled, do if not properly monitored present a risk from a legionella stand-point. A combination of open atmosphere, aerosol generation, at-risk temperatures and stagnant water, all contribute to present a cocktail of risk factors that are more than the sum of the parts. Thomson are able to provide services aimed at tackling both `Traditional` and Legionella related water treatment issues. We can provide complete packages that include Dosing Equipment and Chemicals for use in both Closed Systems and Cooling Towers. Thomson are able to offer a complete range of inhibitors including various blends of molybdates, nitrites, tanins and organophosphonates. We can also offer a variety of oxidising and non-oxidising biocides. A water treatment contract provides regular analysis of make-up and re-circulating waters to ensure full compliance. Reports can be submitted in paper-format for entry into an on-site log book or, as is becoming increasingly more prevalent, electronically. After submission of a user name and password, clients can view or download from our web site, copies of all reports and certificates. All chemicals are manufactured under our own label and distributed nationwide direct to the customer’s site. Sometimes, temperature controls are not sufficient in controlling Legionella and where this is the case, a range of supplementary control measures are available. In recent years Chlorine Dioxide has become the logical “next step” for many water system operators in combating such issues. Chlorine dioxide has been shown to be effective in the removal of the biofilms strongly associated with long term survival of Legionella in both hot & cold water systems. Operators of larger, more complicated water systems such as Hospitals or those managing systems with a history of non-compliance, have found Chlorine Dioxide to be a particularly effective solution in the combat of Legionella Bacteria . 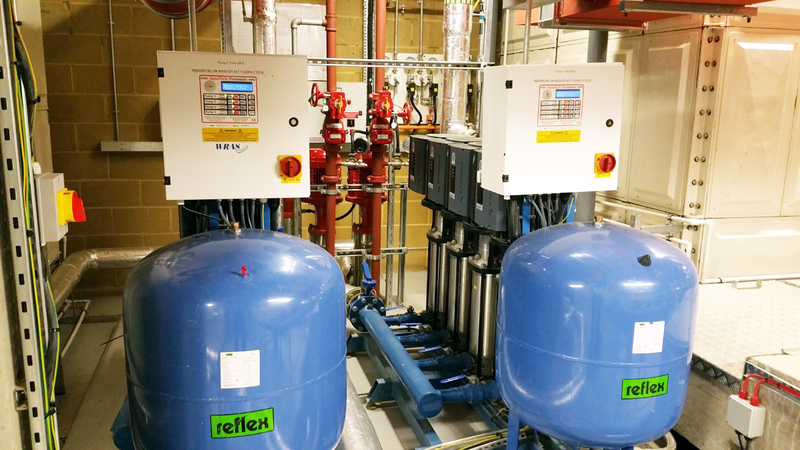 Once a site assessment has been undertaken and the requirements assessed , Thomson Environmental Services are able to supply, install & commission fully automated dosing plant, to treat both hot and cold water systems.